I'm off on a 6 day trip back to see my family so I'll be away until mid next week. Here's an outfit post until then that included this vintage sailor coat I found on eBay (it looks just like the Topshop one!). Hope you all have a lovely week! The detail on that "Tablecloth" dress is mind blowing. And that coat...man oh man. Have fun/be safe on your trip! That coat is UNBELIEVABLE. It is the best coat I've ever seen! Wonderful! adorable! i absolutely love that coat! 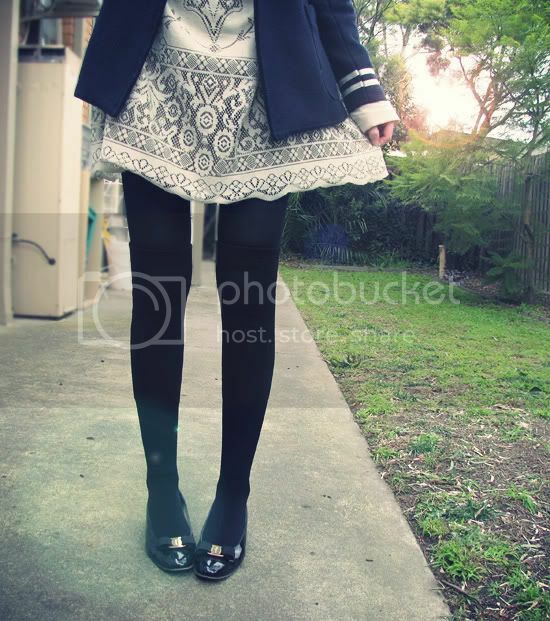 Cute coat, and that dress is just amazing! Like it sooo much. Have a nice time with your family. P.S. Got new Sretsis dresses in the mail today, will do a post soon! Oh, the coat looks just lovely! I love the soft colour pallet- you look gorgeous! I love how you've put this outfit together! The coat is wonderful and its almost like the Topshop one.. I've been trying to hunt down the Topshop one for ages but no luck so far and winters nearly over. AHHHHHH that jacket is way too cool! i'm into all sailor things these days but it seems like everyone else is, therefore stuff gets real expensive on ebay :( congrats on your wonderful find! it's lovely! The coat is so darling! It looks great styled with the pretty lace dress and bow belt. Very cute Sushi! Wow that coat is amazing, and looks lovely complimenting what you're wearing! You look wonderful! I own the Topshop one and I checked: it looks 100 % the same from what I can tell....what a funny coincidence! Even the pockets are placed the same! 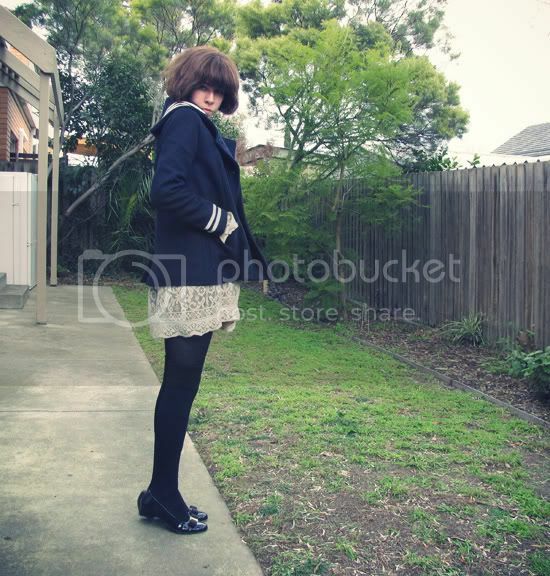 Lovely outfit and I dearly love that coat! Oh wow that coat is perfect!! What a great find. 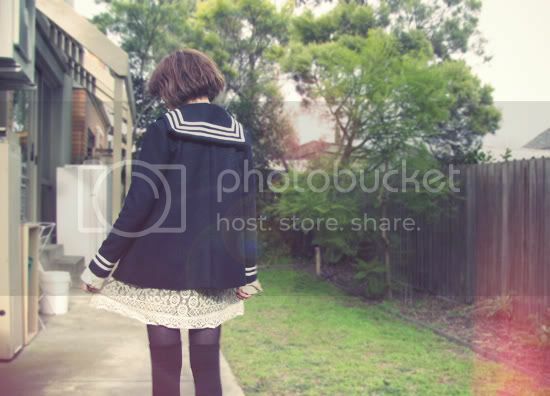 that sailor coat is just so perfect...! omg i love this. 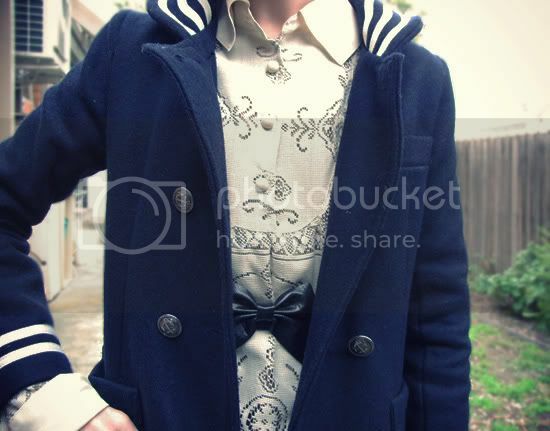 all of the elements are awesome including the bow belt and vintage coat. Great coat! I thrifted a cropped one with a peter pan collar the other day and am excited for fall to wear it. have a good trip. You look beautiful - I love the combination of navy and white. Everything looks perfect ;) You can find many cute things at Ebay XD, I bought two bow belts!! 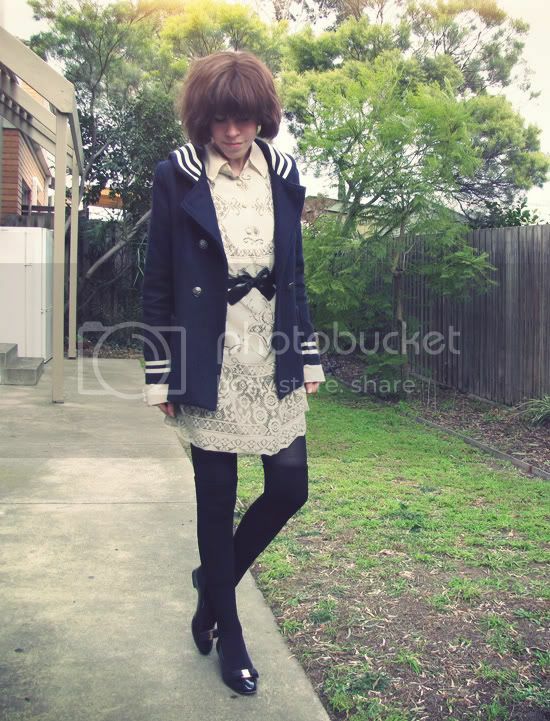 this look is really Alexa Chung! the tablecloth dress...i'm in love. and you make otk socks look amazing! i always feel hesitant to wear mine but whenever i look at your blog i get a little inspiration to pull mine our and wear them. i really love your coat. the coat is just gorgeous. and your hair is really pretty. what a great find! love the combination in textures with the dress! That coat is truly divine! This look is so fab. Just love it. what an awesome coat, that is a really good find. nice! sublime la veste marine, j'aime beaucoup ! 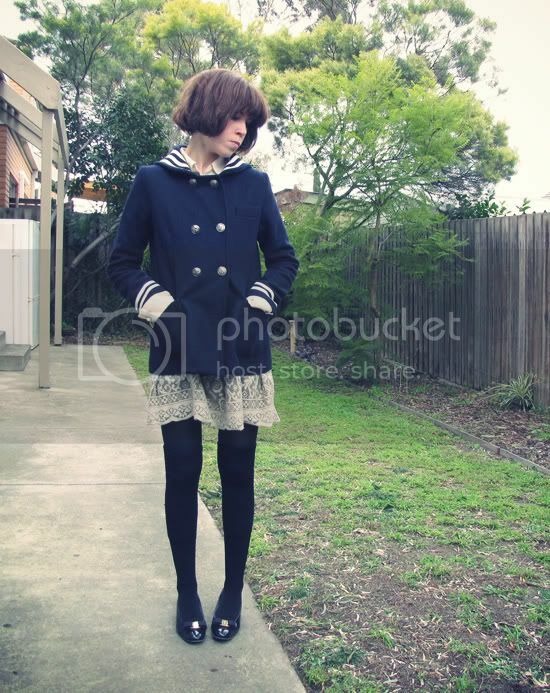 im in love with that vintage sailor coat ! I pretty much love the whole outfit! Love, love, LOVE your coat. Why can I never find some vintage goodies like that when I go thrifting? Love how you paired it with your dress. Omg, I still can't get over your coat. It's beautiful. Oh, and have fun on your trip! just discovered your blog and am so in love with it now~! !love your style!!! I adore this whole look, especially the dress paired with the bow belt! I'm just in love with ur coat ! oh my goodness you look soooo cute! waow awesome coat! love your style.. tha lace dress is amazing! The coat is wonderful! With the lace dress its just stunning! Where did you get that dress!?! ?